You are here: Home / Galaxy Note 4 How-To Guides / How to customize Galaxy Note 4 camera app interface (and shortcut menu)? This guide shows you how to navigate through Galaxy Note 4 camera app interface, and how to customize the shortcut menu in the interface. 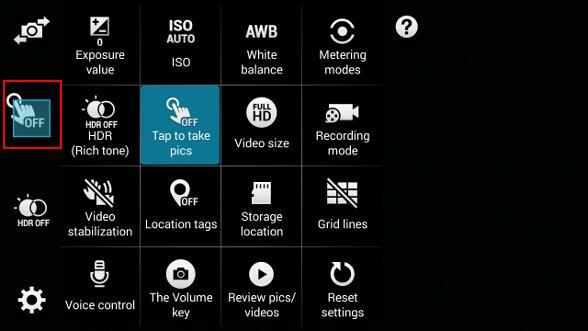 Samsung tried to simplify the Galaxy Note 4 camera app interface, but some Galaxy Note 4 owners still feel it is a bit complicated. Therefore, this guide here is to assist you. Once you start the camera app, you are ready to take pictures by tapping the camera button in the right side as shown below. You can also start to record a video by tapping the camcorder icon. Of course, you can change Galaxy Note 4 camera modes by taping the Mode button. In the bottom right indicated in the pink rectangle, you can find the shortcut to Gallery app. By default, the last taken photo is shown as a thumbnail there. You can tap it to review the photo. 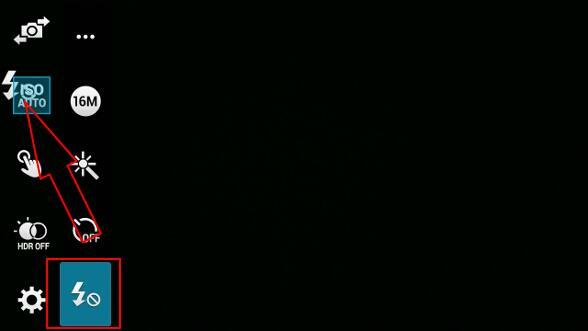 Night mode activated. 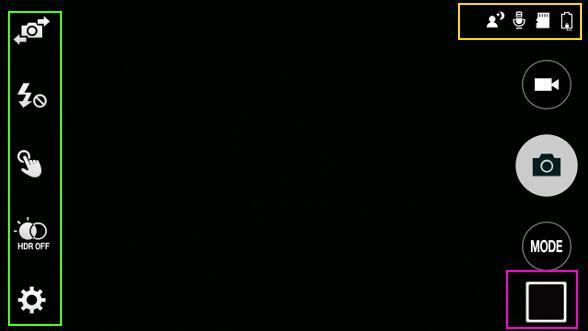 The camera detected that the lighting condition is close to night. Please note, Galaxy Note 4 camera app does not have a separate night mode. If you choose Auto mode, Galaxy Note 4 camera can switch to night mode automatically based on lighting conditions. Voice control is enabled. You can use your voice to control the camera to take photos or record videos. Please check this guide on how to use voice commands to take photos or rerecord videos in Galaxy Note 4. Storage location is micro SD card. Photos (except in burst mode) and videos will be saved to the micro SD card, not phone storage. You may refer this guide on how to set the storage location for Galaxy Note 4 camera. Galaxy Note 4 is being connected to a charger (or an external battery). Of course, the icons in this location depend on the features enabled and some other settings. In the left side of Galaxy Note 4 camera app interface, you can find the shortcut menu (indicated in the green box as shown in the screenshot above). You can quickly toggle on/off the corresponding settings without go to camera settings. By default, there are 3 items there (from top to bottom): Switch between front and rear camera, HDR on/off, and Settings icon. The shortcut menu in Galaxy Note 4 camera app interface can only hold up to 5 items. The first (switching between front and rear cameras) and the last one (settings icon) cannot be changed. So, you can customize up to 3 items in the shortcut menu. To customize shortcut menu in Galaxy Note 4 camera app interface, you may follow these steps. 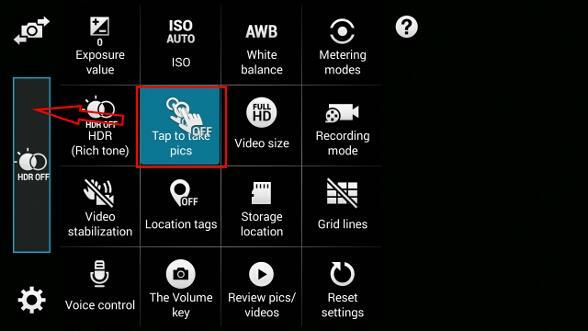 Step 2: Tap Settings–More in the Galaxy Note 4 camera app interface as shown below. Step 3: Tap, hold and drop an item to shortcut menu. For example, we want to add Tap to take pics (which allows you to tap anywhere on the screen to take photos, in addition to the camera button) to the shortcut menu. So, tap and hold Tap to take pics, move and drop it to the shortcut menu area as shown in the following two screenshots. If you want, you can similarly add ISO settings to the shortcut menu as shown below. Once all 5 slots in the shortcut menu are occupied, you can then only replace existing items. For example, you want to use Flash control to replace ISO settings. Tap and hold the flash control icon, drop it the ISO settings in the shortcut menu as shown below. 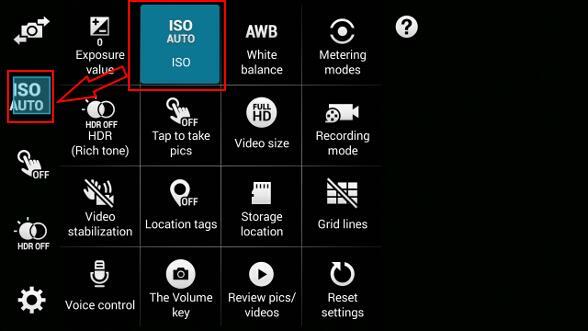 Once you drop the camera flash control over the ISO settings, you will notice the ISO setting is replaced with the camera flash control icon. Please note, the first row in the settings cannot be customized. Also, after adding an item to the shortcut menu in the Galaxy Note 4 camera app interface, the item is still in the original location of the settings. This is the reason why it is called “shortcut”. Step 4: Tap any where to return to Galaxy Note 4 camera app interface. In Galaxy Note 4 camera app interface, now you can tap the shortcuts to turn/off the feature. Can you customize Galaxy Note 4 camera app interface (and shortcut menu)? If you have any problems or questions on how to customize Galaxy Note 4 camera app interface (and shortcut menu), please post them in the comment box below. How do I get the flash to work? 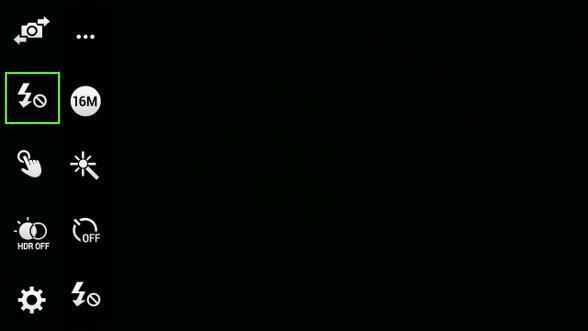 I have it on auto & photos are great in most situations but not at night. There are 3 options for the flash: off, on and auto. When you find auto mode doesn’t weekend well, you can turn it on so it will be activated all the time. Of course, you need to turn it back to auto after that. 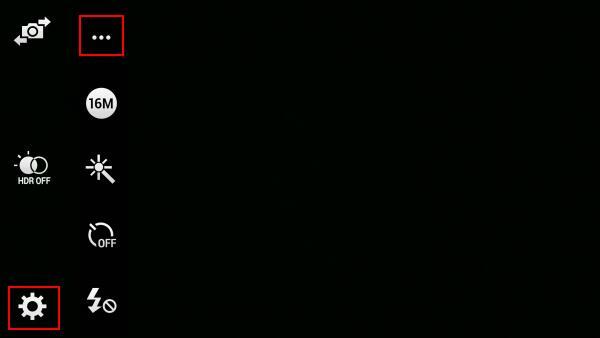 Why do I repeatedly get “camera failed” when I try to open my camera? If I close the camera app and reopen it will work. I have tried running a factory reset and still had the same issue. If you install another camera app (e.g., Google camera), do you get similar issue when launching this camera app? I’m trying to figure out if there’s a way to create a quick access shortcut (to place on the home screen) to record video without having to install any additional apps. Any ideas? As I know there is no camera widgets for this.